HQ reports 48 enemy shelling attacks. On Sunday, May 28, seven soldiers of the Armed Forces of Ukraine were wounded in Donbas hostilities. During the day, Russian-backed terrorist groups 48 times opened fire on the positions of Ukrainian Armed Forces, including by using weapons that are banned by Minsk agreements, ATO headquarters said in a Monday, 29 May release. In the coastal sector, the militants 20 times opened fire on the defense fortifications of the ATO forces. With the onset of twilights, the enemy twice shelled the positions of Ukrainian military on the outskirts of Krasnohorivka from 120-mm mortars. Using 82-mm mortars, the militants attacked ATO forces in the area of Maryinka and Chermalyk. In the vicinity of Shyrokyne, Vodyane, Pavlopil, Hnutove and Novotroyitske, they repeatedly used during the dark hours grenade launchers, heavy machine guns and small arms. In the Donetsk sector, the terrorist armed units until midnight fired at the strong points of the Ukrainian Armed Forces stationed in the suburbs of Avdiyivka, using mainly grenade launchers and small arms, and occasionally 82-mm mortars. From the outskirts of Donetsk, militants shelled the ATO positions near Pisky with grenade launchers. 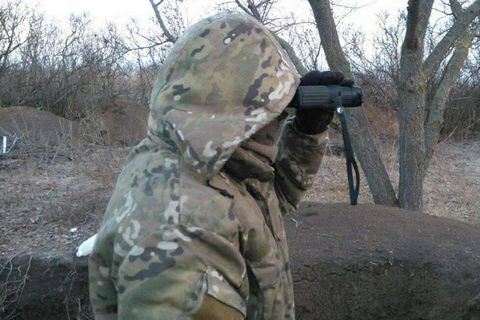 From the suburbs of Horlivka, the enemy again fired the arms of the infantry fighting vehicle and light infantry weapons along the fortifications in the area of Zaitseve. In total, 18 shelling attacks were recorded in this sector. In the Luhansk sector, Russian-backed terrorist groups made 10 shalling attacks, half of them after dark. The enemy fired 82-mm mortars and grenade launchers at the defenders of Yekaterinivka and Krymske. Opposite the villages of Valuiske and Donetske, militants used small arms, and pounded the ATO forces positions from heavy machine guns and a heavy anti-tank grenade launcher at Troyitsky late at night. As was reported, on Saturday, May 27, militants conducted 49 shelling attacks on the positions of Ukrainian military in Donbas. Eight Ukrainian military were reported wounded.